Greenstar's Ecoforce 1 is the first affordable bamboo bicycle. The new Utah company plans to introduce other models soon. Cycling Utah traveled to Interbike, the bike industry trade show, this past fall. There we learned that Utah’s burgeoning bike industry is about to grow by leaps and bounds as three bike manufacturers have relocated to Utah or have started new operations. The three companies are Scott Bicycles, Greenstar Bicycles, and Volagi Cycles. When and where was the company founded? May 2012, Founded in Salt Lake City and Minneapolis, incorporated in Wyoming. When did you move to Utah? Jun Hu lives in Salt Lake City. So does our designer and engineer. 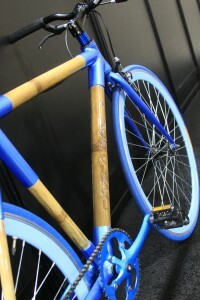 Brief Description: Greenstar Bikes is proud to announce a bicycle breakthrough: the first ever affordable bamboo bike. Bamboo is the perfect material for bicycles. The problem has been that bamboo bikes cost thousands of dollars, putting them well out of reach of most consumers. Not anymore. After almost three years of research, development, and testing, we’ve perfected the art of mass-producing affordable bamboo bikes. Our mission is to design and manufacture affordable, quality bamboo bicycles and accessories using environmentally and socially responsible materials and practices. What types of bikes do you build? We build the world’s only affordable bamboo bike. Bamboo is perfect for bicycles because it is stronger and lighter than steel, but provides a smoother ride due to its natural vibration-dampening properties. And of course it looks beautiful. We believe in doing the right thing. We use bamboo because it is perhaps the most environmentally sound and socially responsible natural material on the planet. It grows fast, requires no fertilizers or pesticides, and is the perfect crop for emerging economies. Our first model, the Ecoforce 1, is a single speed fixed/freewheel. We are currently designing a road/MTB hybrid. Soon we will design MTBs, Road Bikes, and youth bikes. Where are they built and designed? Designed in Salt Lake City, built in China. What's the best thing about your bikes and/or company? We offer the only affordable bamboo bikes. Why did you choose to move or stay in Utah? This is Jun Hu’s home. Where can someone buy your bikes? If they haven’t already, ask your local dealer to start carrying Greenstar Bikes! Anything else you would like to add? For years we’ve admired environmentally responsible products, but we haven’t admired their price tags. Why should it be so expensive to do the right thing? Finally, you can enjoy all of the performance, social and environmental benefits of a bamboo bicycle without breaking the bank. Right: The Scott 930 29er is one of many great bikes that Scott USA makes. When and where was the company founded? The company was founded in Sun Valley Idaho USA in 1958.
Who founded it? Ed Scott was the founder, he was an engineer and up and coming Ski racer. It was Ed’s engineering background and vision for new technology that helped him launch the brand by inventing the first tapered alloy ski pole. Up until this point skiers had always use wooden poles. It was this product that launched Scott onto the map as a leader in product technology and technical innovations. When did you move to Utah? There are two parts to this answer, we first set up a warehouse in Ogden a few years ago, then in September we moved into our office in Salt Lake. Brief Description: Scott USA is a multi-sport company. We have several different divisions Ski, Motorsports, Running and Outdoor, the thing most people probably know us for is the goggle and bikes, but you can see by clicking around on the website Scott offers some of the most advanced products for all our disciplines. We are a company that has been driven by our past but has embraced Ed Scott’s vision to always look to the future for the next thing in both material and technology. What types of bikes do you build? Scott USA offers a full line of bikes on both the road and mountain using both alloy and carbon. We offer entry level bikes for the whole family up to the lightest road and mountain bikes on the market. Where are they built and designed? The company’s main headquarters are now in Switzerland and this is where all the design and R&D happens. Manufacturing is done overseas. What's the best thing about your bikes and/or company? I think that if anyone looks at a Scott they can see the beauty of the design and once you start to dig into the technology you can see that there is a lot of thought that has gone into even the smallest details. We are a brand that has always pushed to be the lightest and stiffest bikes and this is still true. On the road side the Addict SL tips the scales at a little over 12 lbs. for a complete bike; this is lighter than the bikes that our athletes get for the Tour de France. Our mountain bikes have proved themselves this year by winning the World Championships and taking the overall title in the World Cup series and just last weekend our triathletes took 2nd and 3rd in Hawaii at the World Championships. I like to think that our passion for cycling finds its way into every product that we make, if you get a chance to ride one I hope you will feel it too. Why did you choose to move or stay in Utah? Logistically Utah made sense as we had the warehouse and goggle manufacturing here, plus it was a little easier to get too than Sun Valley, which when we have visitors coming from Europe is a consideration. We may not have the small mountain town feel of Sun Valley but the company had grown so much in the last few years we had to move. As an active outdoor brand it is important to stay in touch with that community, so Utah made perfect sense. Where can someone buy your bikes? If you visit the website www.scott-sports.com and choose USA as your region you can then click on the find a dealer button. Anything else you would like to add? I would say thank-you to Utah for welcoming Scott, I know that all the bike people are looking forward to getting out and exploring all the trail systems that you have to offer plus some of the best road riding, the ski team can’t wait for the first snow fall either. We are looking forward to this next stage in Scott’s history. 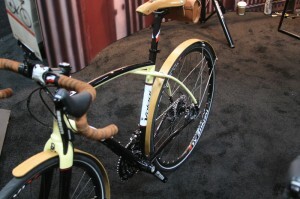 Above: Volagi's Viaje steel bike features Long Bow chainstays for extra shock absorption. was founded in 2010 in Morgan Hill, CA by two industry veterans, and avid endurance cyclists, Robert Choi and Barley Forsman. We are currently scheduled to move into our new Ogden facility on November 1, 2013. Brief Description: Volagi Cycles is a growing manufacturer of carbon fiber, steel, and titanium framed bicycles and bicycle components. Founded in 2010, the company has since staked its claim as an industry leader in endurance cycling products. Utilizing the latest advances in frame construction, progressive braking technology and innovative componentry, Volagi is committed to redefining performance for the everyday cyclist one bicycle at a time. What types of bikes do you build? Where are they built and designed? We build road bikes built for endurance cycling. All of our models feature our patented Long Bow Flex Stay technology—where the seat stays bypass the seat tube and connect to the top tube, thus lengthening the seat stays without creating a longer, slow-handling wheelbase. All of our frames are designed specifically for the use of disc brakes. All of our frames are made in Taiwan, and then shipped to our headquarters where they are meticulously hand assembled and inspected for quality before being shipped to you. Our carbon fiber bike, the Liscio, is the ultimate road bike for long distance rides—comfort, control and performance in an aesthetically beautiful package. Our Steel frame, Viaje, is a road bike with possibilities. With clearance for up to 40mm wide tires, disc brakes, and Long Bow technology, the Viaje is the quintessential mixed terrain machine. From pavement, to gravel, and everything in between. We are currently developing a Titanium version of the Viaje, the Viaje Ti, which will be released in March 2014, and possess all the qualities of the Viaje with the ride quality benefits of Titanium. What's the best thing about your bikes and/or company? While other companies continue to “go by the book” and design bikes that are restricted by UCI regulations, we have figuratively thrown out the book and make bikes that offer the best ride qualities and best technologies for the rider who loves to put in long miles in the saddle. Personally, my favorite thing about working for Volagi is that everybody has a say in the creative process. We all contribute input on how we can better our products and thus we are perpetually progressing as a company. Why did you choose to move or stay in Utah? Let’s face it, it’s tough being a small business in the San Francisco Bay Area. Ogden’s more centralized location will put us in a better position to serve both the East and West coasts, and allow the company to operate more efficiently given its closer proximity to essential resources. We trust that by working in an environment that fosters growth of small businesses we can grow as company as well, and continue doing what we love. Mayor Caldwell and the City of Ogden are working hard to progress the infrastructure and overall atmosphere that will surely rebrand Ogden as the heart of the Outdoor Products and Recreation industry in the United States. We value local bike shops and want to continue to support them. So if you choose to purchase a bike direct, we will route that sale through the nearest Volagi dealer, or your favorite bike shop if there aren’t any Volagi dealers near you. Anything else you would like to add? There isn’t a better environment than Utah right now where there’s a solid core of cycling companies exchanging info and ideas and progressing the sport as we know it. We couldn’t be more thrilled to be a part of it!